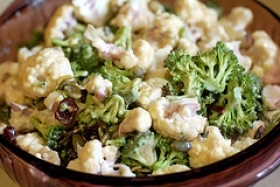 Have you made Autumn Broccoli Salad? 1. In a small bowl whisk together mustard, vinegar, and lemon juice. 2. Add garlic oil gradually, whisking constantly. 3. 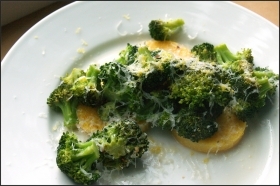 Whisk in 1/4 cup of the Parmesan. 5. Cover and set aside for at least 1 hour or up to 1 day. 6. 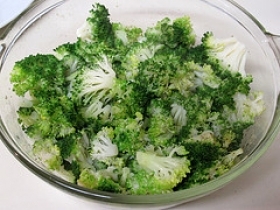 Trim broccoli and cut into florets. 7. Bring a large pot of salted water to a boil over high heat. 8. Add florets and cook until tender-crisp. 9. Drain and immediately plunge into ice water. 10. When cool, drain again and pat dry. 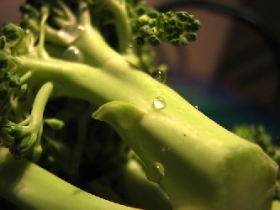 Broccoli may be cooked up to 6 hours ahead, cooled, and stored in a plastic bag in the refrigerator. 11. 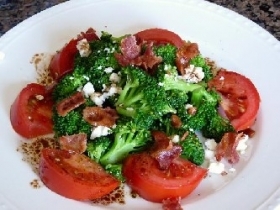 Transfer broccoli to a large bowl along with tomatoes. 12. 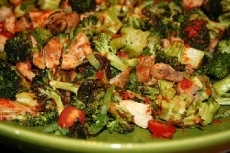 Add dressing to vegetables and toss to coat well. 13. Add green onion and remaining 1/4 cup Parmesan and toss to blend. Note: To make garlic oil, add 6 whole peeled garlic cloves to 1 pint extra virgin olive oil. Marinate at least 1 week before using. Oil will keep indefinitely if covered and refrigerated. 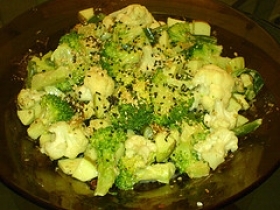 Variation: Cauliflower may be substituted for all or part of the broccoli. 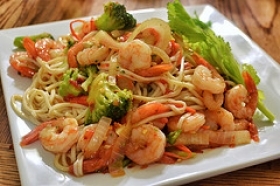 This recipe is high in Vitamin A with 21% of your daily recommended intake per serving. This recipe is high in Vitamin C with 106% of your daily recommended intake per serving. This recipe contains potential food allergens and will effect people with Lemon, Tomato, MSG, Cheese, Sulfites, Spring Onion, Garlic, Fructose Malabsorption, Mustard, Vinegar, Onion allergies.